At Preston on 19 September 1664, Thomas Stanley provided details of the Tyldesleys of Garrett Hall for Sir William Dugdale's Visitation of Lancashire. This pedigree contains individuals who were not mentioned by John Lunn [FN1] (see earlier post). However, elements are open to question. For example the pedigree starts with a Laurence Tyldesley who married Margaret Standish, whereas all other sources—including Flower's Visitation of 1567—suggest this was Lambert Tyldesley. 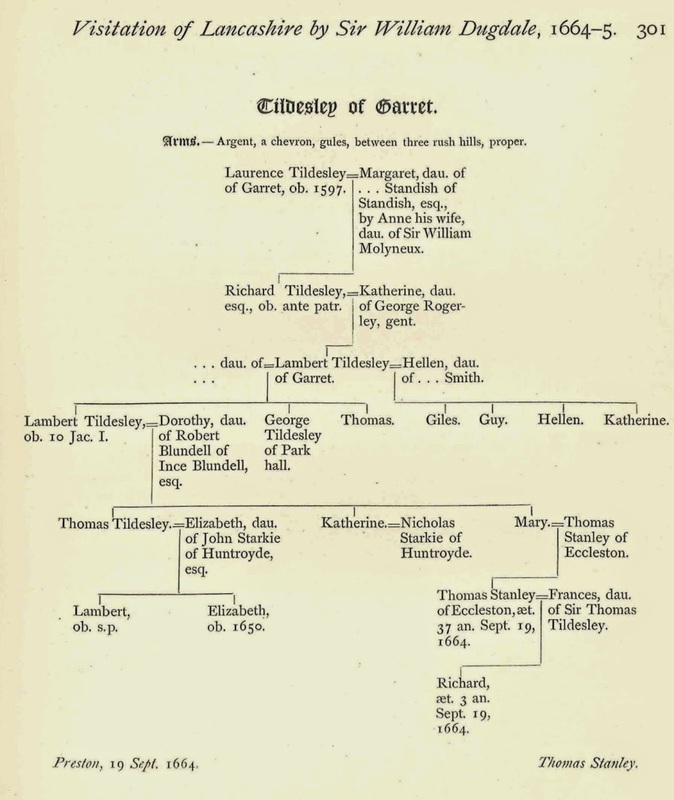 Thomas Stanley had two links to the Tyldesleys: first, his mother was Mary Tyldesley, daughter of Lambert Tyldesley of Garrett Hall; second, he married Frances Tyldesley, daughter of Sir Thomas Tyldesley 1612-1651. The current owners of Garrett Hall Farm, Peel Holdings, have been trying for some years to develop the site—most recently putting forward a plan for 600 homes. These plans have met local opposition with an article in the Leigh Journal, an e-petition and a Facebook group.